BOLT009: Never At Peace e.p. Zainetica's second release on Boltfish Recordings delivers a tranquil 5-track EP of delicious electronica following up from his Remembrance EP earlier in 2004. "It’s a lovely release, this MP3/CDR release by Zainetica on the Boltfish label. 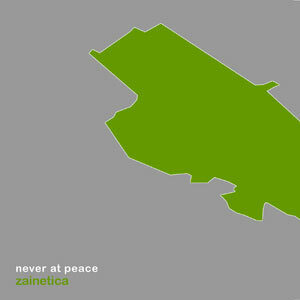 A five-track EP with as many lovely compositions, bass rich with excellent choice of sounds and plenty of warmth "Never at Peace" is a continuation of Zainetica’s "Disorder" incorporated on the Boltfish sampler "Region Zero" released earlier this year. The favourite track on this EP is probably "Feelings That Can Not Be Expressed" with its straightforward beats, heavy bassline and melancholic sounds. It’s the kind of track that is bound for instant replay and that gets better for every listen. "...this is Zainetica on form once again." "Mark Streatfield (a.k.a.) Zainetica (who also runs Rednetic Recordings) delivers a tranquil 5-track EP of delicious electronica following up from his Remembrance EP earlier this year. Never At Peace is a symphony of majestic analog swirls that also treads gently into pensive ambient territory. "Freedom," the opener on Never At Peace flourishes with willow-tree rhythms brushed against upbeat percussion just as "Lovelost" unleashes an atmosphere of fragile emotions. This passionate EP also contains "Feelings That Cannot Be Expressed," a minimal experiment that unveils vocodered moments struggling to release itself from the confines of a cold landscape. "We Have No Voice" sheds similar vocodered chants as it gradually expands and contracts its bleeped-out sine waves. The title track, closing off this 30-minute EP navigates through similar chord structures meshed with Zainetica's weaving vocal highlights --its direction and overall textured progressions makes this EP an effective, low-key ambient excursion worth the purchase price." "Written and produced by Mark Streatfield on UK electronic music label, Boltfish, ‘Never At Peace’ opens with ‘Freedom’ a bubbling track, brimming with echoing filtered vocals and crackling percussive ambience. ‘Lovelost’ follows with an aquatic mood, diving deep into mellow oceans of sound, whilst having a gloomy undercurrent the track remains intriguing with stunning elements straight out of the height of the Two Lone Swordsmen’s world. Three more tracks follow on this release, each one continuing the quality. Ambient music, rolling out dreamy moods and gentle emotions along the way."